Can you tell me where you purchased the vintage Batman movie poster? Hello, this are from IKEA - i believe they still have them. What is the red paint color called, please? The bed is great where did you get it from? overstock.com BUT i will not recumbent to get it. we had to change it. love the bedside table - who makes it? Thank You, Tishe table from a thrift shop that was painted to match the room. Map Pillows - Can you please tell me where you found the map decorative cushions on the bed? They are great. Love the color Red you used? What paint brand and color name/#? color- this room shows color with a monochromatic color scheme and this room uses neutral colors to balance the red in the room. 8. This could very well be a gender-neutral bedroom, perfect for a boy or a girl (since I, too, am a big DC and Marvel fan). 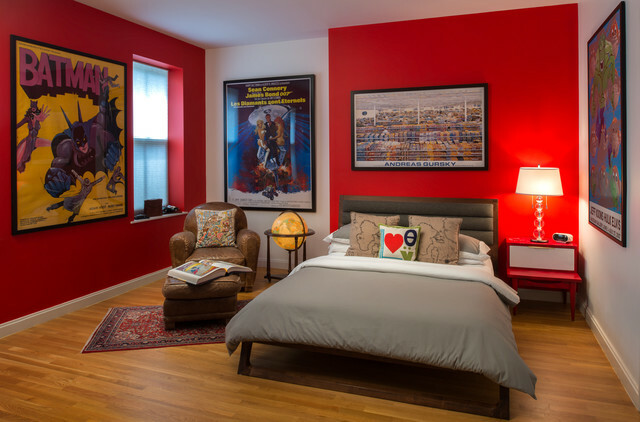 The large framed posters inject a fun, lively vibe and the bright-red wall paint ensures that the environs always remain energetic. The comfortable bed and sofa give the chance to nap and lounge, two other favourite hobbies of most teens.